Discover the work of a modern artist whose paintings are a unique expression of Eastern imagery and Western spirit â€” and an apt reflection of the man himself. Chen Yifei was a Chinese artist who came to America in 1980, leaving behind the security of his position as head of the Oil Painting Department at the Shanghai Painting Academy. By the 1990s, his paintings were auctioned at Christie's in Hong Kong for record prices, and he gained the status of artist-entrepreneur. The most fascinating part of his career was his attempt to combine elements from his native country with the Western traditions of both realism and impressionism. Yifei was trained in the Western techniques of classical realism, which were introduced in China at the turn of the century. Ironically, because of China's isolation from the West under the Communist regime, Chinese art was not exposed to its blatant modernism, which kept the tradition of realism alive. The Chinese regime cultivated young, gifted artists in the same way it cultivated athletes, and Yifei was provided with the best conditions to develop his talent. He rose to stardom in the Chinese art world at the age of twenty with his painting Begin the Avant Garde. In the next ten years, he established himself on a national level with his epic historical works, including The Seizing of the Presidential Palace. Since realism was the only school of art officially sanctioned in China, his success over all his competitors was even more dramatic. By the late 1970s, after the death of Mao Tse-Tung and the remission of the Cultural Revolution, Chen Yifei began to break away from the uncritical glorification of historical events. His painting Thinking of History from My Space, painted in 1979, depicts the specific events of the 1910s and 1920s in China, but portrays the artist's attempt to separate himself from the torrent of events, capturing a moment of deep introspection. In 1980, at the age of 34, Yifei relinquished his academic position and came to New York City, the center of contemporary art, where the school of realism was practically ignored. However, he had the ability and self-confidence to defy the odds. In 1983, his first one-man exhibition at New York's Hammer Galleries created a sensation. His success sent a clear message to the New York art arena: Classical realism is back! However, Yifei did not come to New York in order to take on the art establishment; rather, he needed the unhindered freedom to develop his personal creative aspirations. He said of his first encounter with New York's art world: "Once I had gained confidence to walk past uniformed commissioners at the doors of galleries, I was elated by the freedom to look at art." This is reflected in a visible transformation from his "official" historical work in China to his personal choice of themes and styles in America: In the former, the human figures are interchangeable, and there is no personal attachment to them. In the latter, each individual is unique, and the paintings radiate a release of emotions. 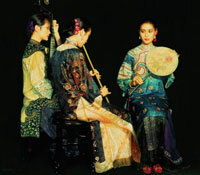 Chen Yifei's work does not fit easily into a "Chinese" or "Western" mold. Perhaps his art can be described as "multi-cultural" — not in the current sense of a person being locked into the ethnic group of his birth, but in the sense of combining the best of several cultures. In 1987 he was inspired by the major exhibition "American Paradise — The World of the Hudson River School" at the Metropolitan Museum, New York. He subsequently made a tour of the river valley area and painted a series of landscapes there. One can also see Yifei’s strong sentimental connection to the natural scenery of his country, as well as to the city of Shanghai, where he grew up. His portraits tend to be realistic, while his landscapes are more impressionistic. 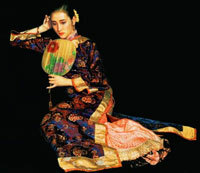 His portraits include Western musicians playing modern instruments, Chinese musicians playing traditional instruments, minstrels in medieval garb, Tibetan villagers, and ballet dancers. His landscapes extend from Venice to the canals of his native Zhejiang Province. One example of how Yifei combines Chinese and Western elements can be found in his painting Poppy. The title is that of an evening song by the Tang Dynasty poet Bo Zhuyi, which expresses the emotions of a young woman sadly pondering the uncertainty of the future. In the painting, however, the figure of the woman has the stable structure of an ancient Greek sculpture. Another example can be found in Lingering Melodies from the Xunyang River, which depicts Chinese musicians in traditional garb, but conveys a Western "carpe diem" atmosphere. Whatever the theme and the style, the common aesthetic link behind all of Chen Yifei's work is a commitment to beauty. In the words of Lawrence Wu, Chen's paintings are "exquisite yet dignified, elegant and refined, yet have heroic bearing."